Scrub oak grows up to ten feet in heoight, producing dense shrub thickets in Chaparral. 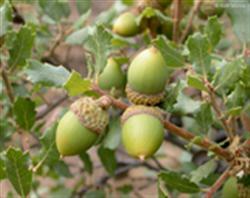 These oaks shrubs bear small, one inch acorns that are edible when processed. Native peoples used these shrubs for food and wind shielding in wind conditions. These 7 to 10 ft. shrubs grow low to the grownd, starving out surface growth beneath it.